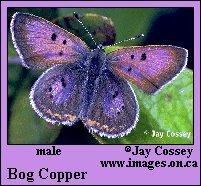 Identification: Upperside of male brownish with purple iridescence; female dull gray-brown. Underside of both sexes white or pale tan; hindwing with very small black spots and red zigzag border on outer margin. Life history: Males perch on low plants to watch for females. Eggs are laid singly at base of host plant; caterpillars feed on shoots and leaves. First-stage caterpillars overwinter in their eggs, often underwater. Caterpillar hosts: Shrubby cranberries in the heath family (Ericaceae). Adult food: Water from raindrops and nectar from cranberry flowers. Habitat: Acid bogs with cranberries and other Ericaceae. Range: Maine south to New Jersey and West Virginia; west through northern Great Lake states and Ontario. Conservation: Habitat is sensitive and subject to draining or conversion to commercial use. Management needs: Conserve habitats of known populations.